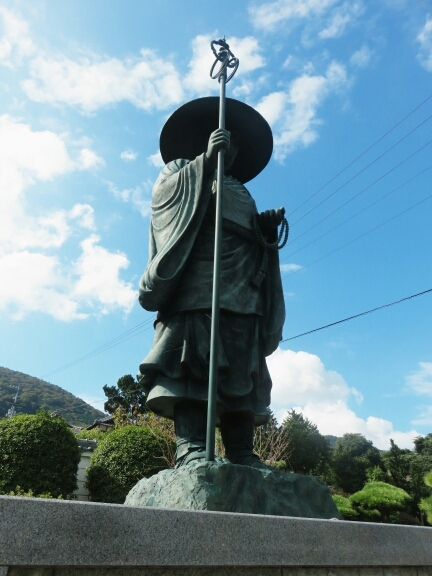 I managed to find my first temple without too much trouble, it was slightly on the edge of the town of Imabari and I needed some helpful people to point me to exactly where it was as I needed to get used to the way the signs worked for the pilgrimage. At the temple my plan to worship properly went out of the window – I had little idea what I was doing and was just about able to handle bowing at the front gate and washing my hands. I think I rang the wrong bell first, didn’t have any incense or name slips and had about one sentence of the sutras written down to read out. I decided that the stress of attempting to navigate the inner workings of Buddhist worship would probably be at odds with the spiritual peace that the journey was supposed to bring so gave up on the more complicated parts pretty much from the start. At temple 54 I was able to pick up a Japanese map book specifically for the pilgrimage which made life easier even if the book was designed very strangely from my point of view. The maps were generally not orientated on north but instead were set up so you read your route on them from right to left. I found this very frustrating as it was something I wasn’t used to at all. Still it made getting around possible and I’d soon reached Temple 57 without any trouble. I’d quickly got into the habit of bowing self consciously at the Main Gate if I remembered and then washing my hands. The act of cleansing my hands with the clear cool water from the wash basins still felt like a luxury after the months in China and Central Asia when running water was often rare. 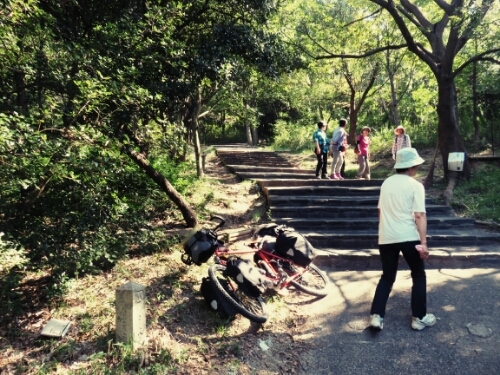 After Temple 57 things got a bit harder…All around the island of Shikoku there are specific walking trails for the Henro that are nicely signed up and are often off the busier roads. I’d decided it would be nice to use these as much as possible. After five temples I realised that I should probably be using these as little as possible. The first ones I had used were down small roads and an occasional grassy track round fields – nothing my bike couldn’t handle. The one I ended up on to Temple 58 went totally off road through a small wood along more of a dirt walking track. It was very beautiful but hard on my bike, if not impossible. Then I hit a thin muddy slope between two narrow banks with roots growing across the way. I had to get off my bike to get it over the roots and up the gradient. 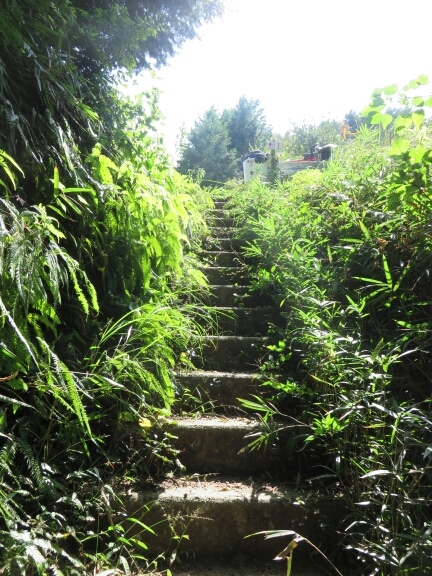 Then I reached a steep flight of steps. 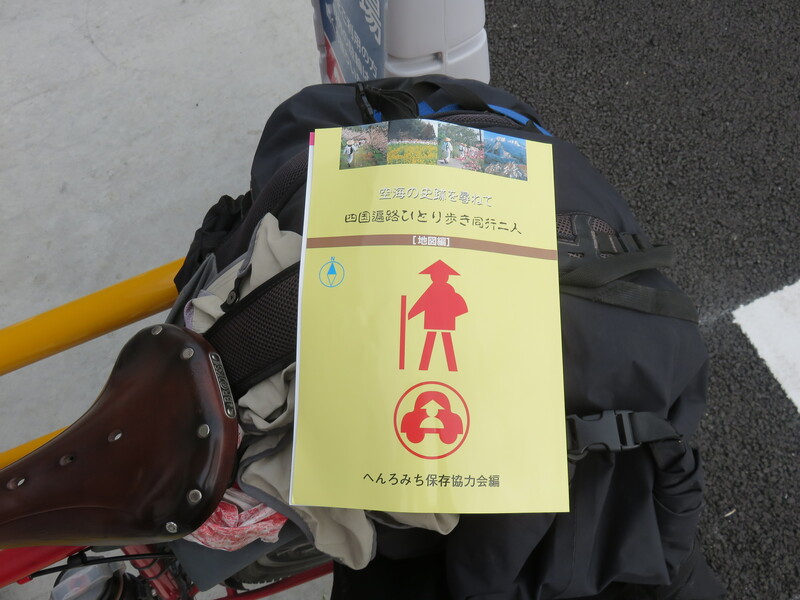 Game over for the walking trails – I had to unload my bike and carry it up separately from my luggage. I was exhausted and covered in sweat after this and I now knew that I would only use the walking trails when I was sure they were on tarmac! At the top I was a bit wobbly: manhandling my bike coupled with that climb had taken it out of me. Luckily arriving at a temple acts as a natural break as I wandered around taking photos and trying to take it in. At this temple I noticed that they had a shower in the toilets and thought that this would bode well for the future and keeping clean. The next temple was a lot easier to reach thankfully and I followed a walking trail that I now knew to check was on roads from my map book. This wound round a bit but was more interesting than just ploughing along the main road. By the time I reached temple 59 it was already getting fairly late and I realised I probably wouldn’t reach Temple 60 before it got dark. So I popped into a shop and bought a bento and some snacks for dinner and started off to Temple 60. From my mapbook I could see that it was at over 600m so I knew it was going to be quite tough. And indeed it was, I was soon climbing and this kept on and I knew that rather than probably not reaching Temple 60 tonight, I definitely wouldn’t be. On my map I could see a mountain lake that I would be passing and I thought that camping here would be nice so I worked to reach that. Only to be disappointed – the lake was beautiful but its shore was sheer, rearing up as cliffs making it impossible to camp beside. So I carried on upwards winding round valleys and rises as I climbed up the mountain. There didn’t seem to be much chance for camping as there was not much flat ground at all – luckily just after the sun had set I found a path off the road and was able to set my tent up in the twilight. I wolfed my bento down before retreating into my tent away from the mosquitoes. 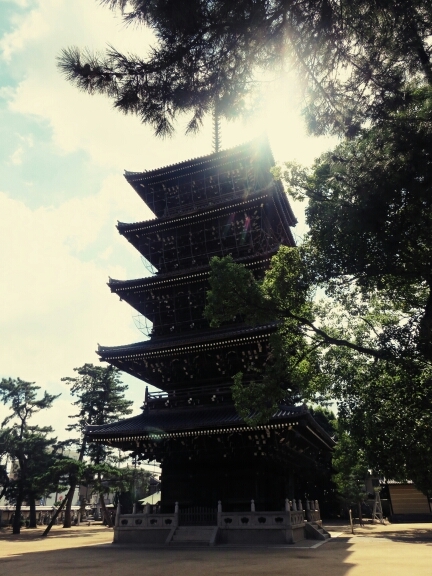 For the first day as a henro I had managed to cover 50km and see 6 temples. I wasn’t sure if that was a good pace or not, I was sure that I was covering a lot less ground than I was used to but that I was having a great time. The second day started bright and early for me as I wanted to get going with the first light. So I packed my tent up and began making for the top of the mountain I had stopped on. This made for a pretty tough start to the day – well to be honest a really tough start to the day. The climb was brutal with gradients of well over 10% for most of the way and it was also higher than I had expected topping out at 740m. So I spent a lot longer grinding my way to the top than I had readied myself for. It was also a bit cloudy when I arrived so not the amazing views I had hoped for. Going down was almost as hard as going up in some ways as well – the descent was so steep I had to keep my brakes on almost the whole time so I didn’t go flying off the mountain on a corner. When I checked my rims after I’d come down a few hundred metres they were too hot to touch. The next four temples were near to the bottom of the mountain and were very close together thankfully. 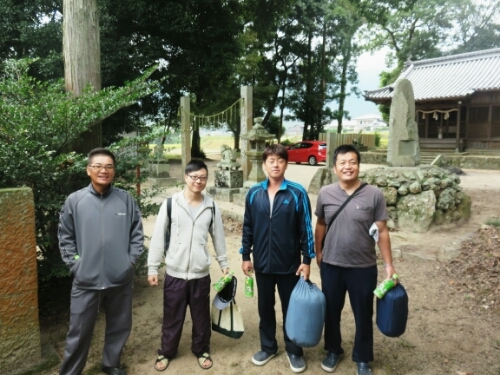 I was able to visit them quickly before heading off to Temple 65 about 45km away. As I made this ride the weather got very blustery and the sky clouded over more. 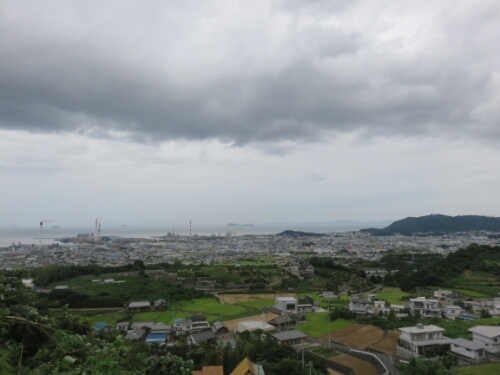 I was a little nervous about this as I had been warned that a typhoon was coming so the wind and portentous looking skies didn’t fill me with confidence. 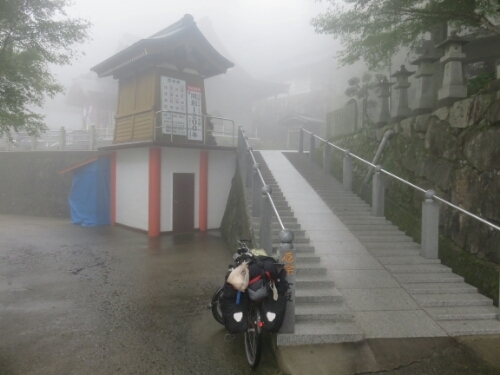 When I reached Temple 65 which was another temple at the top of a nasty climb I asked about somewhere to stay as I wasn’t sure I wanted to be under canvas if a typhoon was coming in. Unfortunately there didn’t seem to be many options on the way so I rode off trusting to my luck. Similarly to the day before, evening was closing in as I made my way to the next temple: Unpenji. This one was also on top of a mountain and I was pretty sure I wouldn’t be reaching it that day as it was the highest temple on the whole pilgrimage at over 900m. I decided to just see where I reached and hoped for the best. On the way I had my first experience of one of the traditions of the Shikoku pilgrimage – that of Osettai or gifts/support. This is where pilgrims are given gifts or support by non pilgrims in order to help them around on their pilgrimage. I was stopped by a man in a small truck and he gave me a can of coffee and asked some questions about where I was from and what I was doing and was generally very nice. Sadly I don’t drink coffee at all but it is the thought that counts. 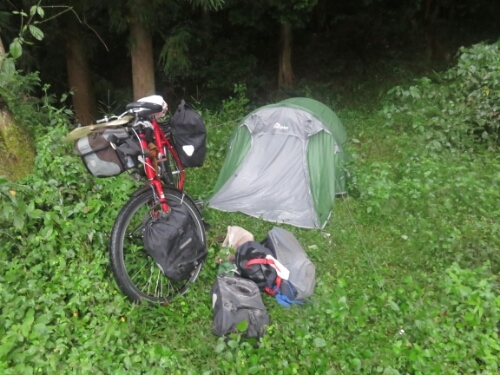 As I carried on riding I ended up more and more off the main roads and couldn’t really see any likely looking places to find proper shelter for the night so as darkness had almost fallen I just pulled off the road and put my tent up on a small piece of clear ground under some trees. I hoped they would provide some shelter and wouldn’t come down on me if the typhoon started in! That night I hadn’t managed to buy some any dinner so it was backup food time. This meant eating tinned tuna with some cold Ainsley Harriot couscous from the UK. There were too many mosquitoes outside to use my stove. They were literally everywhere and I’d gotten mauled just putting my tent up. Luckily I also had a large snickers bar from Korea and a gel pack I’d bought earlier to try, so I got my calories. Thankfully during the night the full force of the typhoon never materialised and it just rained a bit. Later I would learn that it had turned and the main part had luckily missed Japan. 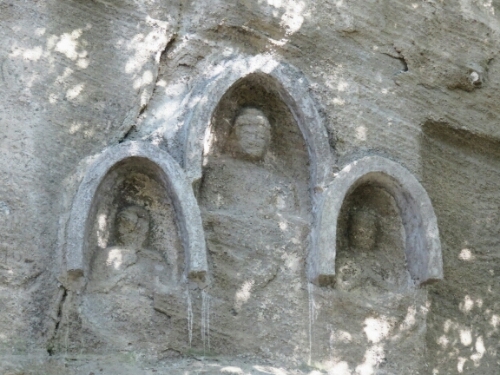 Day 3 – 25 September. When I woke it wasn’t really raining much anymore but it was quite misty and it kept drizzling so I was soon feeling pretty damp and I unfortunately had to start climbing straight away like the day before. Thankfully it wasn’t quite as brutal to start with and I gradually worked my way up. It wasn’t long until I reached a turning I thought I was supposed to take but it was blocked off quite clearly by bollards and the signs appeared to suggest I should go a different way from my map. It wasn’t quite clear so I decided to carry on a bit and see if another turning appeared. Disturbingly it was downhill from here, disturbing as I knew that I would still have to make my way up to over 900m at some point. After I’d been going down for a while I realised that this probably wasn’t the way I wanted to go and that I needed to turn back – I’d seen an old man a little way before and decided to try and ask him the way. With much broken Japanese I think I’d worked out that I could probably take the blocked off way with my bicycle and that it would get me to the temple. This may just be what I wanted to understand though. So back I went reclimbing the route I had just come down. I got to the bollards and just manoeuvred my bicycle around them. I figured that it would have to be a pretty drastic problem with the road to stop me getting through on my bike. At the back of my mind I was still pretty worried I was might be about to waste a lot of energy. I wasn’t riding long before a truck went past me which made me think I’d definitely be able to get through if there were motorised vehicles using the road. I thus kept on with renewed vigour. Until after a kilometre or two I saw the truck again. 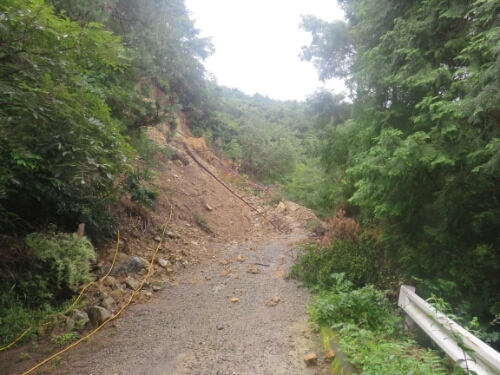 It was pulled up in front of a massive land slide – its occupants seemed to be there to drain water off for whatever reason be it to make clearing it easier or to stop it getting worse. This was somewhat worrying. On inspection this landslide seemed passable if I unloaded my bike and carried it over One landslide, I figured, I could handle but if there were more worse ones I might be setting myself up for trouble. So I whipped out my broken Japanese to try and find out if there were more landslides from the guys working there. From what I could gauge this was probably the only one but they didn’t really know. I hate turning back so over I went to carry on riding up. Thankfully there were no more landslides, just a very long misty climb that I pushed myself through. I was already starting to feel that there was perhaps too great a tendency for putting temples on top of very steep inaccessible mountains. Building them in the past must have been really, really hard. The temple at the top was quite nice but it was ruined a bit by the pervading dampness of the day and the fact that I was feeling pretty tuckered out and it was still quite early on in the day. At least I knew I had a fair bit of downhill from now and to improve my mood more it started to clear up as I descended. The route down off the mountain was incredible, taking me into a valley before climbing up over some very country roads into another prefecture and back to the coast. The road I took is definitely not the standard route for walking henro and even more so not for driving ones. 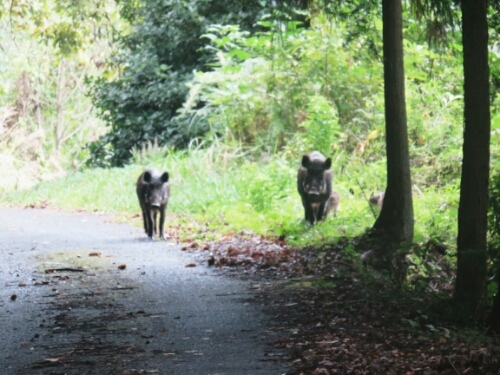 It was littered with debris and I saw wild pigs as I rode. It was lovely though and the descent back to the coast was incredible. I made my way to Temple 67 dried my tent and some clothes in the car park as I looked around and then headed off for Temple 68 which I nearly reached before realising I’d left my buff back at Temple 67. After some frantic back tracking I eventually made it to 68 which happily was at exactly the same spot as 69, so two temples for the price of one. At this spot I met Jill an Ozzie who was also doing the pilgrimage. She had started off walking the whole route but was now using trains in order to make sure she covered the distance. She’d started in August when it was still incredibly hot – I was glad that I was riding now when the temperature was a lot nicer. AsTemple 66 had taken so long it was already pretty late by this point and so I just managed to get to Temple 70 before it closed for the night – not that that mattered particularly for me as I could still look around even if it was no longer manned. I then set off to find somewhere to camp. First I stopped into a supermarket and bought quite a lot of food as I’d ridden through lunch proper. Riding on I was passing through a fairly flat area – this means highly populated. 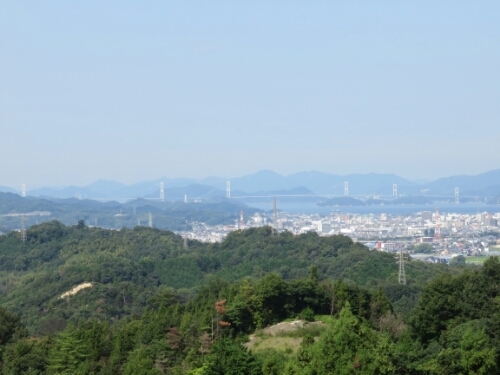 Japan is so mountainous pretty much every flat area of any size is built on. This meant there weren’t any obvious stealthy camp spots available. 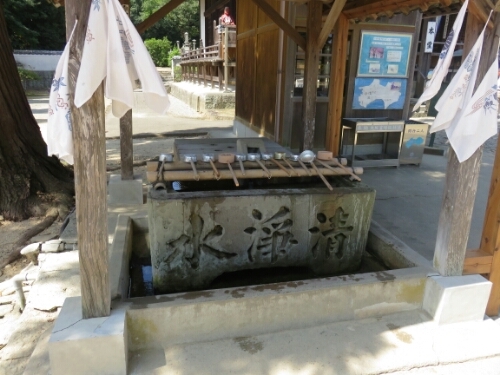 Then I saw a shrine and remembered Jill mentioning you could probably camp at these. So I wandered around the grounds looking for someone to ask but couldn’t find anybody. It looked good for camping though so I thought I’d better check at the building next door and see what they said. This was a hair salon and when I tried to ask about camping in broken Japanese the owner surprised me by speaking good English which is pretty rare in Japan. She didn’t know if it was OK to camp there but asked at the restaurant next door and the general consensus was that it was ‘probably OK’. This was good enough for me and my tent was up and I was stuffing my face in record time. Randomly I also picked up an unlocked wifi signal from somewhere nearby meaning I could use the internet. At times like these my tent felt better than a lot of the hotels I had stayed in on this trip. 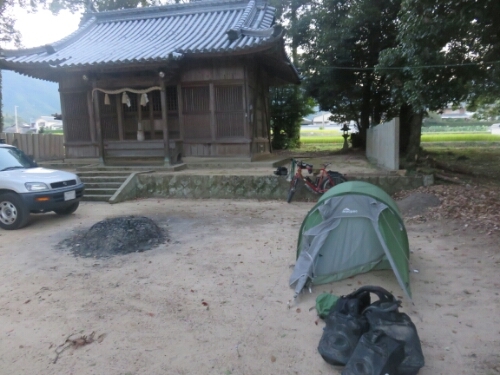 I’d now ridden about 210km over the three days and had visited 17 temples. The fourth day dawned bright and sunny and it would end up being a long long day of temple visiting in which I would manage to fit 11 temples into. Looking back it all seems a bit of a blur in which I saw a lot of nice temples that almost merge into one. I do know that I saw the largest of the temples on the pilgrimage, which is Temple 75 as well as a lot of other pretty smaller ones. The final two stick out as they were up a mountain again which saw me messing about at 400m once more, as usual there were at least stunning views to take my mind off it. 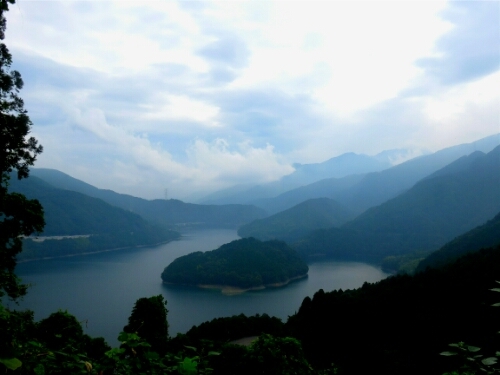 Once I had seen temples 82 and 83 I headed back down out of the mountains they were up in and into the city of Takamatsu. Takamatsu is one of the larger cities on Shikoku and I didn’t think I would be able to get out of it before full dark fell. 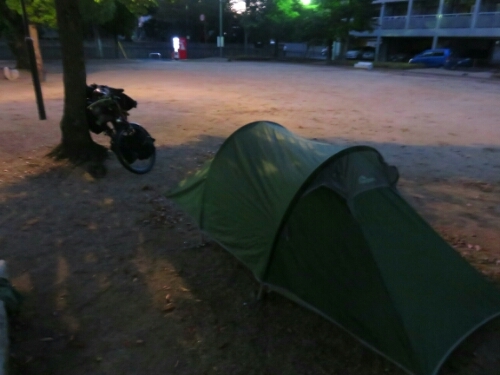 I thus decided to try and find somewhere to camp in the city and see how that went. In the end I spotted a public park surrounded by flats and just put my tent up there on the basis that if anyone wanted me to leave they could ask. It made a good spot as the ground was flat, there was a public toilet in the park and it had some street lighting I could read by. In the end no one asked me to leave and I was even able to sort of wash in the sink in the disabled toilet. I was again lucky with the weather and was happy to get off temple hunting again. The day started with Temple 83 which was nice and easy on the flat. Sadly after this it got hard… I got a bit lost in town looking for Temple 84 and ended up just heading in what I knew was the right direction even if the roads weren’t the most direct. 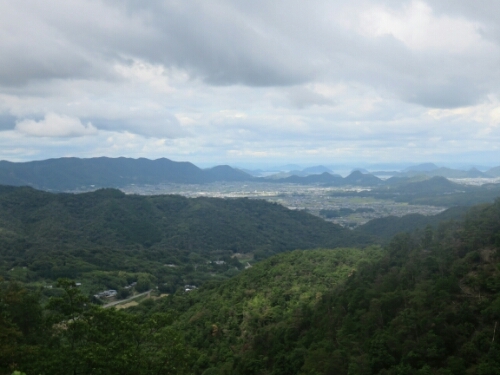 When I got to the area of the temple it turned out it was right on top of a small mountain about 300m high. Stupidly while there was a road to the top, bicycles weren’t allowed to take it and it was only for cars. Which looked ridiculous as the road seemed to be as wide as most and could no way have been more dangerous than some of the windy tracks I’d shared with cars up to higher temples. So I assume the reason bicycles were forbidden was not safety and was instead due to some unknown stupidity. I was pretty frustrated by this temple as I had wanted to get my bike as close to the entrances of the temples as possible and I felt I’d been unnecessarily prevented from doing so here. Still it was a nice spot at the top and the walk probably did my legs good. The next temple was incredibly tough as well. This one was similarly placed atop another steep mountain around 300m high that was close to the last temple. 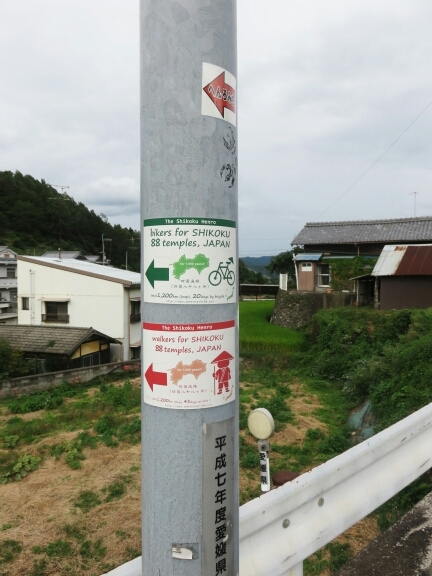 At this temple there was a small road that I was able to take my bicycle up – it wasn’t busy because most people with cars were taking the cable car that ran parallel to it. It wasn’t long before I was wishing I was taking the cable car too. 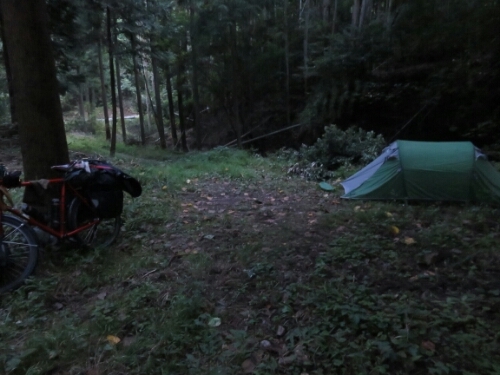 Getting 30 to 40kg of bike and luggage up incredibly steep Japanese mountains is no joke. 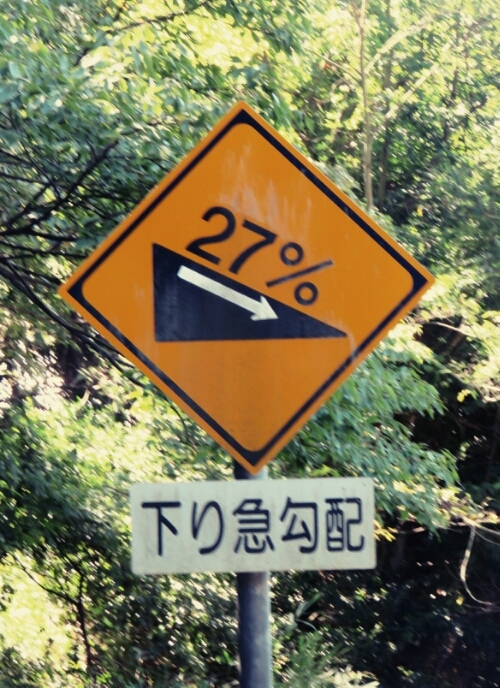 This time I knew I was going up almost 30% gradients as there was a helpful sign telling me so. Coming down wasn’t much fun either as I had to sit on the brakes and hope that they would be able to stop me from running down out of control. If my brakes had gone I don’t know what would have happened it was so steep. 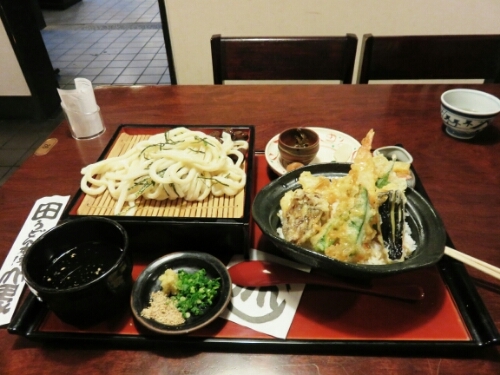 After these two tough temples I treated myself to some nice udon at what seemed to be a very popular restaurant. I had to wait to be seated there were so many people passing through. Happily it was worth the wait. The following couple of temples were much easier as they were on the flat and I saw them with no trouble. The next temple: number 88 was a bit harder as it was up at almost 500m. Luckily the climb wasn’t too tough and I got up there sweaty but not too exhausted. Temple 88 was a bit different from the temples before as it was traditionally the last one on the pilgrimage. There was, for example, a large case filled with pilgrims staffs as they would leave them here to mark finishing their journey. 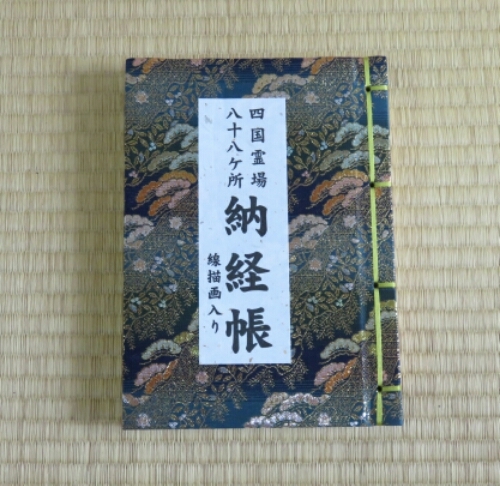 At this temple I decided to buy a stamp book. At each temple you can get a stamp to prove you had visited it. Now why would you get it at Temple 88 I hear you ask. I’d already done over 30 temples so I wouldn’t be able to fill the book. 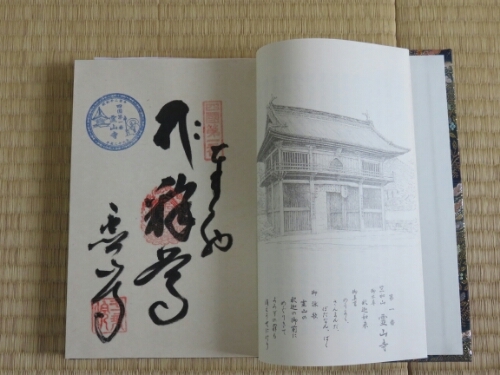 Well the reason is that the stamp books are incredibly beautiful in themselves and each stamp is a work of art made up of number of different stamps and the name of the temple hand written in beautiful calligraphy. The only draw back is that each stamp costs 300 yen or about GBP 2 which adds up when you have 88 to get. So at the beginning I had decided to save money and not do it. As I’d ridden and seen more of the stamps I’d decided that it would make a lovely souvenir even if I didn’t get them all. So I’d get a book and a few stamps so I would have examples of what they looked like. The last temple seemed like a good place to start for me as it wasn’t my final temple. After getting the book and my first stamp I started to descend off the mountain and head towards Temple 1 which was a a fair way away. I knew I wouldn’t reach it that night so I was looking for somewhere to camp as well. After a bit of riding down through the mountains I rode past a group of Japanese people, one of whom waved. As I went past I noticed they were sitting outside a building that was in front of a shrine so I thought maybe I could camp by the shrine. So I put the brakes on and turned round and headed back. They looked a bit surprised to see I’d stopped but were quite happy for me to camp out the back at the shrine once I had explained myself. So I set my tent up and was about to start cooking a delicious dinner of noodles (there weren’t any shops up in the mountains) when one guy came over with a beer which I gratefully received. Shortly after another man came over and asked if I wanted to come and eat with them. While I am sure my noodles would have been delicious, especially with a can of tuna upended in them, I decided it was good to be social and headed over. Now I was better able to take note of the group and I could see there were about ten guys of various ages and one young girl outside and a few more women and children inside the building. 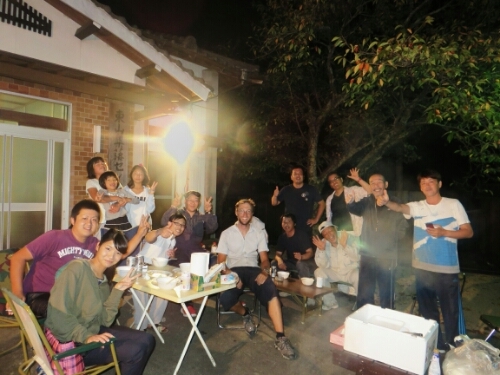 Everybody was amazingly kind and it wasn’t long before I had a bowl full of meat from the Japanese BBQ they were making – a bowl that was never empty for long. They also made sure I had beer and were very interested in my journey. The children inside kept peeking outside to look before hiding back inside if they saw me looking. As the evening went on I worked out they were some sort of club for a form of Japanese dance accompanied by Japanese drums. I was treated to a performance of this later on – I had no idea what was going on but apparently the dance was to ward off evil. When I first got there I thought no one spoke English but as the beer flowed it transpired that one guy actually spoke English quite well as he had lived in America for a few months. This is sometimes the case with Japanese people as they are quite shy about speaking English. In the end they had me pack up my tent so that I could sleep in the club house building that we were eating the BBQ outside of. One of the men was kind enough to let me use the shower at his family home and he and his wife brought me a futon and bedding to sleep on. When I got back to the club house it turned out I wouldn’t be sleeping in there alone as three members of the club would be staying there too. I’m not sure if they do that normally or if it was just to keep me company, irrespective of that they were amazingly generous giving me breakfast in the morning as well and waking up as early as I did to make sure I got off OK.